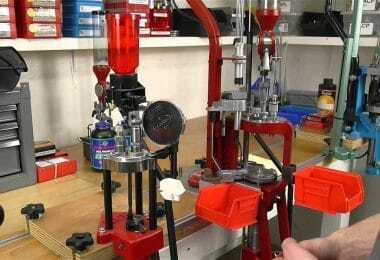 Are you tired of not having a reliable tool by your side when going camping or hunting? If you can’t seem to find the right tool when you most need it, then getting a fixed blade knife might help you out. However, since there is a range of knives available, it can be hard to choose the best fixed blade knife to buy. The knife you choose needs to be lightweight, durable, and have a sharp, strong blade. The handle should be strong, corrosion resistant, and easy to grip – and of course, not fail you when you most need it. Our review will tell you what features to consider when choosing the best knife for your needs. 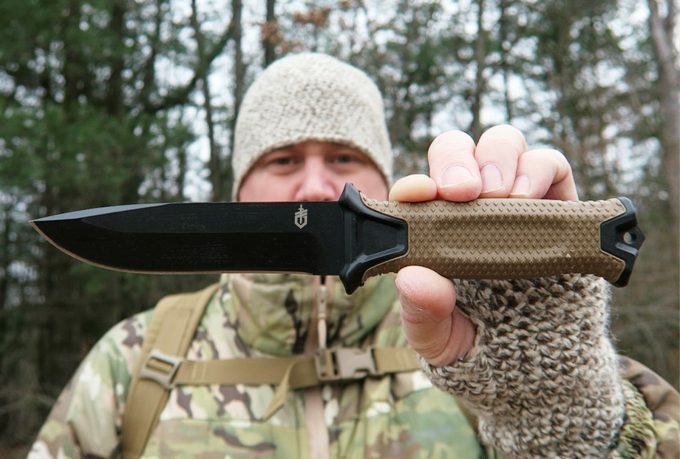 Apart from informing you about the most important features, we have also decided to give you a review of some of the best fixed blade knives on the market today. After reading our review, you should be able to decide which of these knives best suits your needs and budget. Here are a few things we think may matter the most when it comes to buying the best fixed blade knife. You want to buy as lightweight a knife as possible, but that is still of high quality and highly functional. Obviously blade length and weight of the knife will vary, so you need to think about what you will be using the knife for. A small lightweight knife with up to a 5-inch blade is probably good enough for small camping tasks. For tougher jobs, a bigger knife with a longer blade may be needed. 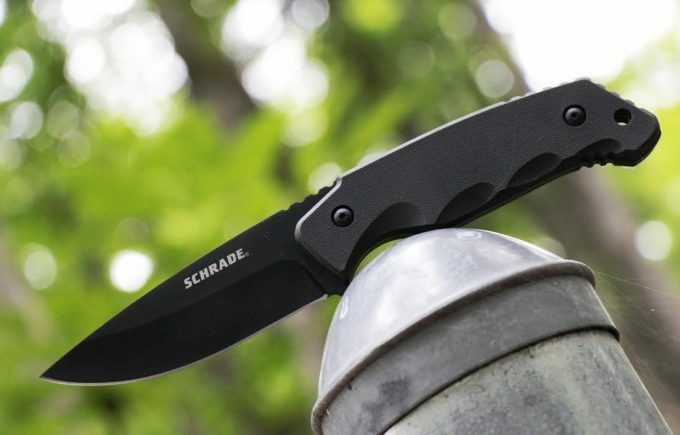 A smaller knife and blade has the advantage of being easier to carry around with you. However, if you want additional strength you may need a heavier knife with a longer blade, which will be stronger and able to do more. If you plan on going on a hunting trip then a larger stronger knife may be preferred. Although, some people may actually prefer using smaller knives for hunting. It really may depend more on the type and strength of the blade than the size of the knife. What type of handle does the knife have? When asking yourself this, think about the material that is used to make the handle. You want a handle that is corrosion resistant and strong. Ensure that the handle is moisture resistant and durable. It also needs to be easy to grip and not likely to simply slip out of your hand, even when wet. Some of the knives have finger holds which are very convenient and ensure a strong steady grip on the knife. The quality of your knife blade is influenced by the type of steel that is used to make the blade. Stainless steel has the advantage of corrosion resistance but is much softer than carbon steel. The hardest stainless steel is 440c which has a high carbon content. The 420HC is also a premium steel; the HC stands for high carbon. Still good but not as strong is 7Cr17 high carbon stainless steel which is similar to 440a but has more vanadium which makes it last longer. The Sandvik 12C27 possesses enhanced edge retention because it is also a high carbon steel. Whichever steel the blade is made of, having added carbon will give it more strength. 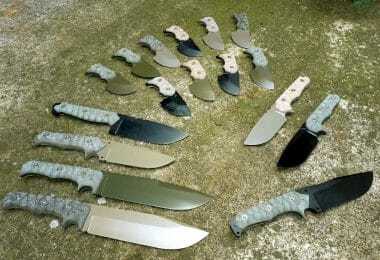 The type of knife blade is also very important because each type has its pros and cons. A clip point blade, for instance, is popular in many fixed blade knives since it has plenty of cutting edge and a sharp, controllable point. The point though is weak compared with some types of blades, such as the tanto which does have a very strong point for piercing tough materials but then does not have much edge for cutting. The spear point has a very strong, sharp point but has a minimal cutting edge. Clip point and drop point blades have a mix of cutting edge and sharp points. The drop point has a large edge for slicing, so makes a great hunting knife. We have given you several questions you should ask yourself before considering what fixed blade knife to buy. Bearing all of this in mind, now it’s time to go over some more popular products on today’s market. We have provided reviews below on the best fixed blade knives on the market today. Reading these will help you to decide which fixed blade knife will best suit your needs. The MTECH USA MT-528C Fixed Blade Knife is a full tang knife that comes with a drab olive green cord wrap handle. The wrap handle may not be very durable over time, and the cord is not genuine paracord, but you can always rewrap the handle with genuine paracord. 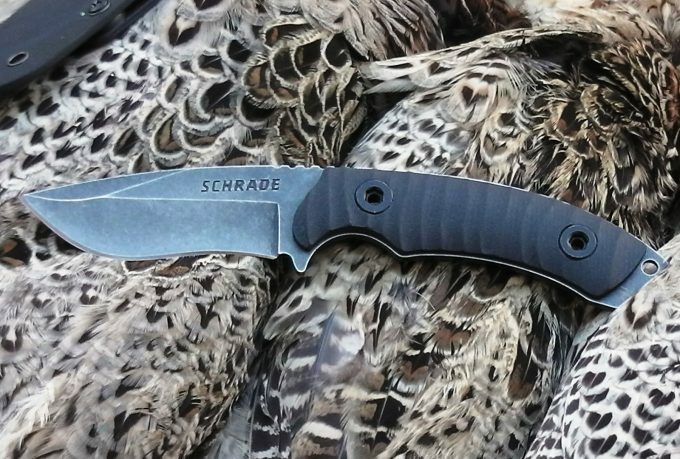 This knife is made of black-coated, 440 stainless steel. The knife has a drop point blade and sharpened top edge at the tip. It is light and easy to carry and use as a general purpose knife. The blade may however, need to be sharpened out of the box when it arrives, but is easy to sharpen though. The cord wrap that comes with the knife is definitely poor quality. 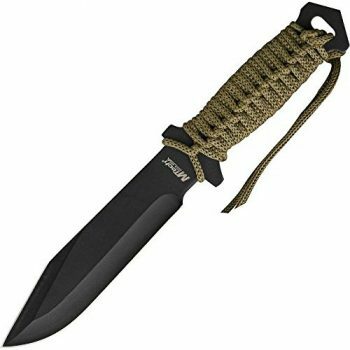 The knife comes with an olive drab colored nylon belt sheath, but this is made of cheap material and will not be very durable. It does have a lanyard hole. It is a good knife for the price it sells for. Having a drop-point blade is a big advantage and the fact that it is full tang means added strength. Related: Since the blade may need to be sharpened when it arrives, we recommend you buy a sharpener. The Puck Dual Grit Knife Sharpener will do nicely. 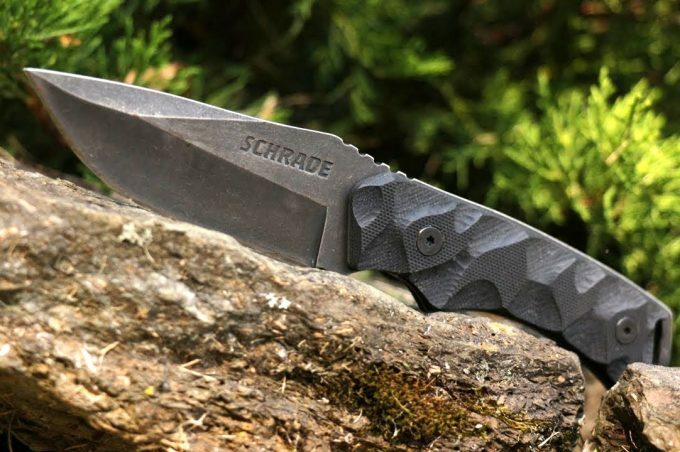 It is small, can be kept in your pocket and the Dual-Grit design provides both a coarse side for cutting and shaping, and a medium side for final sharpening and finishing of the knife edge. The SHEFFIELD Rogue 10-inch Hunting Knife is not a full tang knife so it is not as strong as a full tang knife would be, but it does come with a nice sharp edge, which is easy to sharpen. This knife is made of 440 stainless steel. It does come with a sharp blade that is a partially serrated tanto point. The handle is sturdy and durable and made of TPR rubber. It is ergonomically designed and offers a nice comfortable grip. The blade of the knife is very long compared with some comparable knives, which may be useful. The fact that the knife comes with a sharpener is an added bonus. It does come with a sheath and a fire starter. The fire starter is also easy to use and can be used to make small campfires. This is very convenient to have, as this knife can also help in a survival situations. The knife also comes with a little plastic piece to cover the point of the blade so it doesn’t penetrate the sheath. The sheath doesn’t appear to be very good quality and the securing straps are on the short side. Related: To add to your survival kit we recommend you also buy the LifeStraw Personal Water Filter. This is a small, 9-inch water filter that can be easily carried with on a hike, hunting or camping trip. It is small enough to carry in a bug out bag or in a backpack. The CIMA High Hardness Hunting Knife has a straight blade and it comes oiled. The blade edge is symmetrical has an even grind on both sides. The steel is heat treated so it is hard and the overall geometry of the blade is very good. The knife is a full tang with a blade made of 7Cr17MOV Steel of 68HRC hardness (this is on the higher side of hardness). The blade thickness is 0.177 inches. The blade is made of hard steel and holds an edge nicely. The knife blade comes sharpened out of the box and is easy to sharpen up again. You can cut several pieces of firewood with this knife before the blade dulls. There is annodization on the blade that prevents rust. 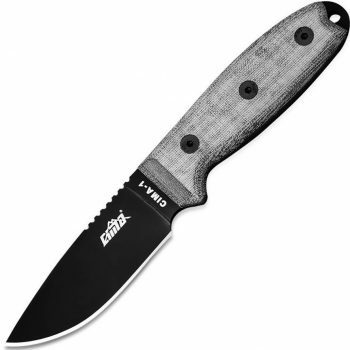 The micarta handles are non-slip and wear-resistant. It is textured, so feels quite rough, but this is to provide a good grip surface, which it does. The knife is strong, durable and not easy to damage. There is a tactical hole at the base of the knife for attaching a lanyard. The knife comes with an ABS sheath with a belt clip, which is convenient to carry and protect the knife. The metal belt clip is quite heavy though, and makes the sheath a bit too heavy. The knife does not fit snugly in the sheath and tends to move around quite a bit, the rattling during a hike may be irritating after a while. Related: Since the ABS sheath is somewhat inferior, we recommend buying a nice leather sheath that will better fit the knife and will last. 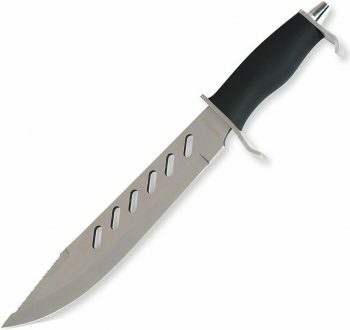 We recommend the Sheaths SH1133 Straight Knife which can hold blades up to 4 inches long. This will be a stronger, more secure and durable fit for your knife. 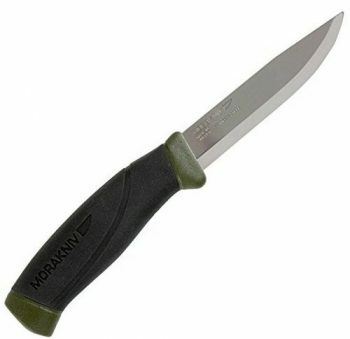 The Morakniv Companion Fixed Blade Outdoor Knife is a ¾ tang knife made of stainless steel for marine and outdoor applications. Stainless steel knives are more corrosion resistant and resistant to oxidation than carbon steel knives, and so are good when being used in water. This is a Swedish made knife that is made of hardened Sandvik 12C27 stainless steel, with a blade that is of 0.1-inch thickness. It holds a good edge, but may not arrive sharp, although it is easy enough to sharpen. The length is adequate for use in hunting as well. It is light enough to carry with you and is very shiny, which means it can be used to signal for help in an emergency. The knife also has a patterned, high-friction grip which makes the knife nice and comfortable to hold. It comes with a color-matching plastic sheath which also has a belt clip. The knife can be used for preparing food, creating tinder, and cutting small limbs and for any work in water. This knife is easy to sharpen and is very useful but the steel is not as strong as high carbon steel, but it has the advantage of corrosion resistance. The feel in hand is excellent, it has a nice non-slip grip. The center of the handle has a soft rubberized coating and the two ends are of a hard plastic. The knife has a limited lifetime manufacturer’s warranty. The sheath is not the greatest quality, but does okay when wet. 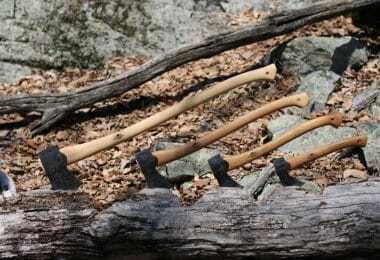 It is good for small jobs around a campsite and can even be used to skin a deer. Related: Since the knife may require more sharpening on arrival, and so as to maintain the knife, we recommend buying a sharpener. The Rexway Compact Design Knife Sharpener will do the job nicely. This is a 3 stage diamond coated sharpening system that has an extra ceramic wheel system to give you a fine perfect result on your blade. 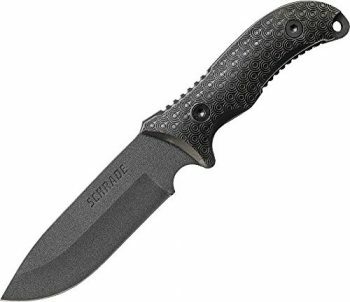 The Schrade SCHF36 Frontier Fixed Blade Knife is a full tang knife made of powder coated 1095 high carbon steel. This means it is very tough and durable, much harder than a stainless steel knife. The spine is a ¼-inch and very strong. It has a drop point blade with finger choil. It is a stout, strong, reliable blade, although the coating may peel off after a while making the knife less attractive. The handle is ring textured and made of TPE (rubber-like material) with a spine and grip jimping to provide for a good gripping surface. It has jimping on the spine at the front of the handle and on the underside of the grip in front of the pommel. The jimpings and finger choil makes stripping wood feel easy. The handle has a hole for attaching a lanyard. The knife also comes with a black colored polyester belt sheath, a Ferro rod with a striker, and a sharpening stone. The knife is somewhat heavy but this is what is needed for strength and for batoning wood. It also easily shaves tinder. The sheath is adequate but probably won’t last very long since it is made of polyester. Related: We recommend buying a decent leather sheath to hold this knife. 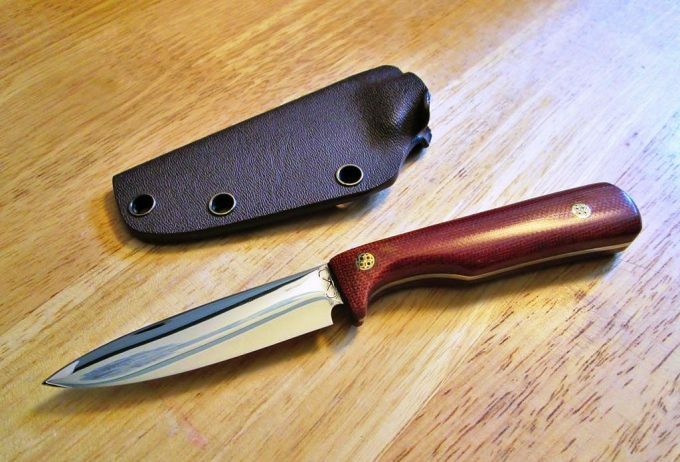 We recommend a sheath that holds up to 5-inch blades, so the Sheath Fixed Knife Sheath will work well. It is made of genuine leather and can be attached to a belt It will definitely last longer than a polyester sheath. The Smith & Wesson H.R.T. SWHRT9B Fixed Blade Knife is full tang, made of black 7Cr17 High Carbon Stainless Steel. It has a dual edged blade with a spear point and blood groove. Being double-edged the point is strong and very sharp. However, cutting edge is limited in spear point blades. The double edge and sharp point mean you can injure yourself quite easily, so you need to be careful. It has a sharp edge, and strongly pointed tip upon arrival and has a good blade edge. The knife has a nice feel to it and weight is good. It comes with a black rubber wrapped handle and the handle does have a hole for a lanyard to attach. The handle has grooves, to provide a good grip and is sturdy, even when wet. This knife also comes with an excellent black leather sheath that you can put in your boot or on a belt. The knife is very durable but won’t be able to chop down trees or limbs, but will be able to be used for small tasks when a pocket knife won’t work. Related: To keep your knife blade in the razor-sharp condition we recommend that you buy the Smith’s PP1 Pocket Pal Sharpener. This has a tapered round diamond-coated rod with carbide blades for coarse and fine sharpening, it also has ceramic stones. It also has a lanyard hole so you can attach to a lanyard or hang on a hook. 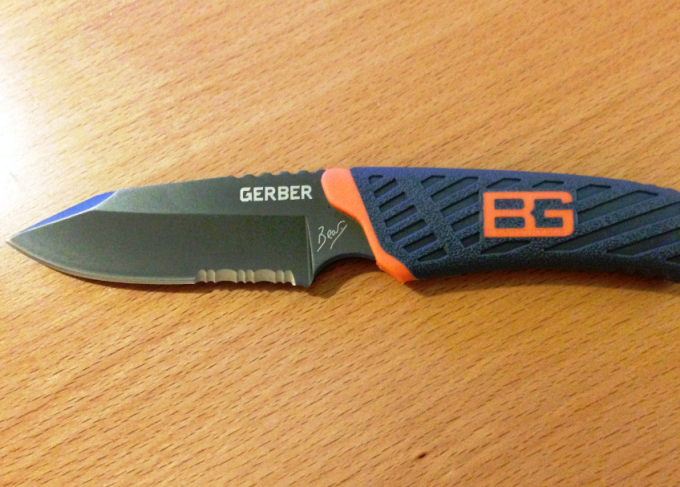 The Gerber StrongArm Fixed Blade Knife is a black-colored full tang knife with a ceramic-coated very hard, 420HC blade. The blade is stainless steel with a versatile drop point type blade. The ceramic coating provides corrosion resistance and durability. The drop point means the knife has a thick belly and strong point for heavy tasks. The top of the blade is angled down to avoid accidental puncturing. This is a plain edged knife with no serrations. The spine is ground to 90 degrees and can be used with a Ferro rod. The blade is symmetrically ground and has a sharp edge. The knife handle has a rubberized diamond-texture for a strong secure grip. The base of the handle contains a striking pommel with a glass breaker to allow you to break through hard surfaces in a rescue situation. The grip is secure enough that it won’t slip even when wet. The grip shape is neutral and comfortable in the hand allowing for many grip options. The sheath and knife are made in the USA. The modular sheath is MOLLE compatible and so can be mounted on MOLLE, on the belt, or traditional drop leg. The sheath has snaps to mount the knife vertically or horizontally. It will fit a standard 1.75-inch tactical belt. The sheath is made from a high-quality thermoplastic with plenty of rivets and lashing points for molle and paracord. The sheath has a detachable clip for scout-carry and can be adjusted for another molle type carry on the back side of the sheath using a removable clip. 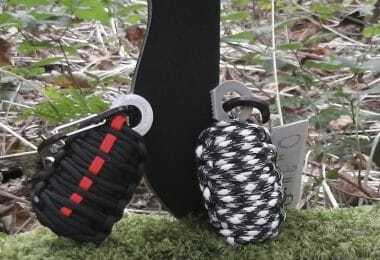 The sheath also has thick nylon webbing for drop-leg belt carry. 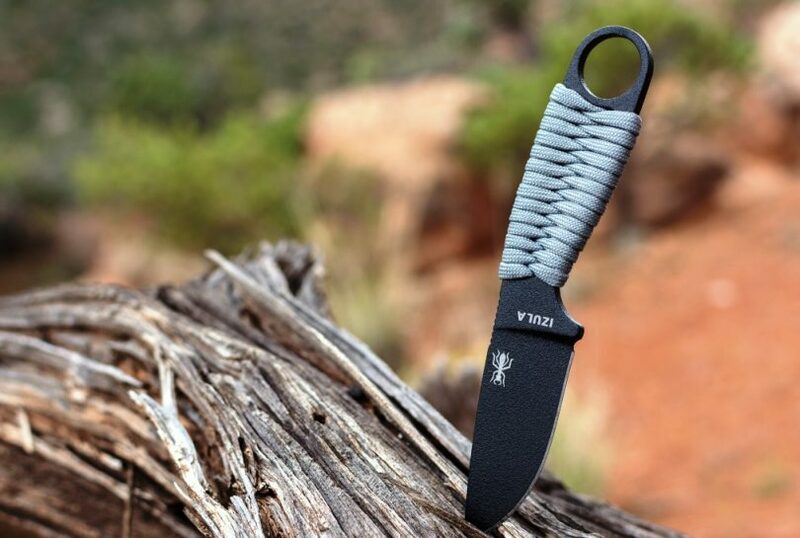 The button snaps are strong and the sheath is designed so you can insert the knife into the sheath in either a left or right-handed orientation. 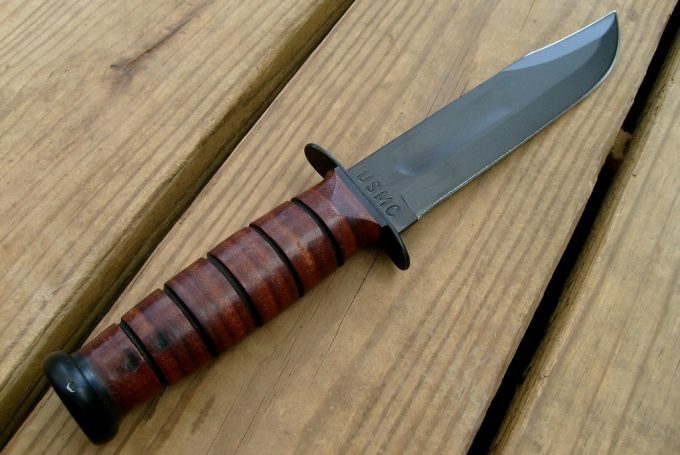 Related: It would be useful to also buy a Ferro rod to have with this knife since it is a well-made survival knife. We recommend adding a Bayite Survival Fire Starter. This compact fire starter is wind and weather resistant and comes with a lanyard hole. It works in all weather conditions and would be an excellent addition to any survival kit. The Smith & Wesson Search & Rescue CKSUR1 Knife is full tang but the metal narrows considerably at the handle making it weaker than it should be at the hilt. The clip point is not as strong as some other blade types but it is useful for cutting in tight places or for detail work. This knife has a black 7Cr17 high carbon stainless steel blade. The blade of the knife is a dual-edged clip point type. Although not a premium steel, it does hold an edge nicely. The handle is wrapped in black rubber and has deep grooves for greater gripping power. The handle ergonomics are good, it provides a comfortable grip. The knife comes with a heavy-duty nylon sheath that has a synthetic liner. It has metal reinforcements and lashing slots. It includes a D ring and front mounted storage pouch with Velcro closure. Related: Since the stone that comes with the knife is not a premium sharpener, we recommend buying a better sharpening stone such as the Three Way Cut Premium Knife Sharpening Stone which has double-sided 1000/6000 grit to allow for both the sharpening and honing of your blade. It is an easy and safe to use high-quality Whetsone product that can be used to sharpen all sorts of blades. The MTech USA MT-086 Hunting Knife is a black colored knife with a straight edge 440 stainless steel blade. This is a full tang knife with a blade that is 0.12 inches thick. The knife is extremely strong and thick. It holds an edge well and does not need to be sharpened often. The knife has a handle with wing walk inserts for a good grip which also works well in wet conditions. The handle is made of ABS and has a glass breaker at the end. It is not the most comfortable grip though, and is designed for people with large hands so may be difficult to hold if your hands are small. It does have finger grooves and the grip material is non-slip. It comes with a black nylon sheath for easy and safe carry. This may not be very durable over the long term though. The handle does come with a hole for a lanyard as well. This knife is very solid, strong and tough and can be used to chop small 3-inch diameter saplings and branches. 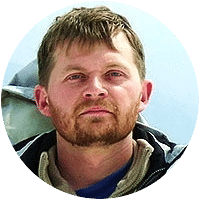 The blade is thick enough to make the knife strong so it can be used for batoning, cutting, splitting pieces of wood and even for pounding in tent stakes. This knife is heavy, sturdy, and well-constructed. It is larger and more robust than some other fixed blade knives. Related: We recommend also buying the Ka-Bar Leather Sheath which is made of genuine leather. This nice high-quality leather sheath can be attached to a belt and will hold up to 7-inch blades. It will be more durable and tough than a nylon sheath, besides which it is an attractive sheath to hold your knife in. To sum up, choosing the right fixed blade knife ultimately depends on your needs. The length of the blade, blade steel, type of blade, handle, and size and weight of the knife are all important factors to consider. How you plan on using the knife is also obviously important. For instance, do you want a small lightweight camping knife or do you want a hunting or survival knife? If you need a hunting knife then you will want a larger knife and probably a knife with a drop-point blade which has more of a cutting edge. For camping, a drop- point or a clip-point would be best – for survival, look for a sharp knife which also has a glass breaker or Ferro rod. Are there other fixed blade knives that you know of that we should include in our list? What other features do you think are important in choosing a fixed blade knife? Leave us a comment and let us know.